Can artificial intelligence (AI) learn from the tacit knowledge (experience and intuition that is difficult to verbalize) of human experts from attorneys and marketers to doctors and researchers and analyze massive volume of data that requires effective judgment to become ever more accurate and faster? (7) In speeding up discovery of new drug candidate compounds for researchers engaged in the R&D of novel drugs at pharmaceutical companies. This “intuitive” and patented AI learns the tacit knowledge from the hypotheses of the researcher to search and investigate relationships with diseases that are likely related and drugs that change similar genes, target gene networks, and can also emerge new diseases that are closely related to specific compounds, as well as realizing statistical significance difference tests essential to evidence based medicine. This week, we highlight the under-the-radar listed Asian exponential innovator FRONTEO (TSE: 2158) who is Asia’s leading legaltech innovator powered by AI and expanding its AI solution “KIBIT” into healthcare and business intelligence as a SaaS (Software-as-a-Service) recurring revenue model for non-legal clients. Guided by the mission to illuminate the darkness lurking in data by securely identifying the risks and opportunities buried in records by utilizing technology, FRONTEO (formerly called UBIC) was founded in Aug 2003 by Masahiro Morimoto as a legaltech company supporting eDiscovery (electronic evidence disclosure) and digital forensic services for clients involved in US and international cross-border litigation, corporate investigations and intellectual property disputes. The data analytics platform Lit i View with “predictive coding” technology which supports multiple Asian languages (China, Japan, Korea) was developed in 2012 and was further enhanced with the AI engine KIBIT developed in Nov 2015 that is leveraged upon to develop the AI Solution business for non-legal clients. FRONTEO’s KIBIT series had acquired the number one market share of 26.8% based on sales value in the domestic natural language analysis market for 2016 and 2017 in the independent ITR survey announced on 11 Dec 2018, which is nearly doubled that of the 13.9% share held by the second place vendor. KIBIT uses the proprietary and unique “landscaping” AI technology to learn the “tacit knowledge” (experience and intuition) of human experts and, unlike all other AI technologies, KIBIT requires only small volume of data for effective machine learning to produce good quality output and solve customers’ problems. FRONTEO’s business model is a mix of project-based revenue (legaltech business) and recurring revenue (AI Solution business) with improving profitability in overall TTM (trailing twelve months) operating margin of 8.9%, ROE (= EBIT/ Equity) of 22% and ROA of 7.6%. The AI Solution business turned profitable in 3Q FY18/03 after hitting an inflection point in moving from PoC (proof-of-concept) for its clients to the full-launch stage and has amassed a wealth of solutions and cases to aid marketing; sales jumped 1.4-fold yoy and clients grown 1.8 times yoy to more than 121 customers as at 2Q FY2019 (Sept 2018). FRONTEO’s AI Solution business serves clients in the financial & healthcare industry/ “KIBIT Knowledge Probe” (MUFG Bank, Yokohama Bank, Resona Bank, Aeon Bank, SMBC Nikko Securities, Mitsubishi UFJ Morgan Stanley Securities; Daichi-Sankyo, LITALICO), compliance/ ”KIBIT Email Auditor” (Toyo Tires, Innolux, Evergreen Marine), and patent analysis/ ”KIBIT Patent Explorer” (Denso, Kikkoman, Sapporo, Kuraray, Showa Denko, Toray, Toyobo). FRONTEO launched its second AI engine “Concept Encoder” in Dec 2018 for the healthcare industry in drug discovery and clinical trials. Whereas KIBIT excels in natural language processing, Concept Encoder can analyze data other than language, including symbols and gene expression. The AI Solution business is expected to contribute 13% and 7.1% of sales and operating profit respectively in FY2019/03. In its new medium-term plan announced in May 2018, FRONTEO expects its AI Solution business to increase in sales from 1.8bn yen in FY2019/03 to 5.8bn in FY2020 and 11.8bn yen in FY2021, and contribute 31.2% of operating profit in FY2020 (645m yen) and 57.1% in FY2021 (2.418bn yen). 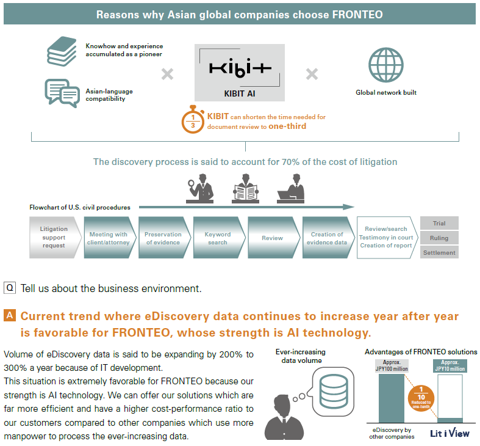 In its legaltech business, FRONTEO has far superior eDiscovery support tools in which Lit i View is the only platform that supports Asian languages without the garbling problem and the only one that offers end-to-end eDiscovery services that combines a workflow system plus AI analytical tools KIBIT that increases the efficiency and accuracy of the document review process, a critical aspect of eDiscovery that accounts for 70% of the cost. Lit i View platform has a review management dashboard where clients can have up-to-the-minute metrics on review progress, which includes a heat map within Lit i View that provides a detailed snapshot of reviewer progress and productivity and enables course corrections as needed. Most litigation cases in the US do not reach trial (examination of facts in a public court). Usually, a settlement is reached during pre-trial. However, unlike in Japan, in the US the victor of a settlement is largely determined by the discovery process, wherein evidence is presented to each side. Therefore, discovery plays a key role in ensuring that the terms of a settlement are as favorable as possible. As such, discovery can determine the outcome of litigation and the discovery process account for 70% of the cost of litigation. However, despite its overwhelming technological superiority, FRONTEO has faced great difficulties over the years in trying to break through the established practices of US litigation cases that involve Asian companies, its main market, and grow its market share from the current 3%, as well as achieve a stable targeted operating profit margin of 10%. eDiscovery providers are often selected by the Asian companies’ US subsidiaries or by US attorneys, not by Asian companies themselves. In other words, when a lawsuit is filed in the US, Asian companies have a strong tendency to leave the selection of lawyers and other service providers to their local subsidiary. US lawyers tend to leave the choice of eDiscovery providers to their litigation support teams but the attorneys have a powerful sway in the vendor decision. Thus, unlike the other AI innovators we have investigated whose solutions were readily and rapidly adopted by their clients to solve high-value problems, FRONTEO was an odd case that stood out because the legal industry was particularly resistant to utilizing AI despite its effectiveness since the hours spent can be billed back to the clients and the attorneys make or influence the decisions on the IT vendor based on “relationships”. In short, when FRONTEO targeted its powerful AI legaltech solution to the end corporate clients in Asia involved in litigation suits and to the US litigation support team, it neglected its ultimate client – the US attorneys – and lost the war. A positive inflection point in its legaltech business could be near after the completion of structural business reforms at its US subsidiaries in FY18 helped FRONTEO to win several large Asian (including Japanese) clients in 1H FY2019 and the management comments that “We are finally able to do what we’ve been really wanting to do” and expects a strong 2H pipeline with several more orders. After 15 years since its founding in 2003, FRONTEO finally established a global legal headquarters in US in April 2018 with global offices under direct control of this HQ to strengthen the overall sales structure and better build relationships with US law offices, strengthened internal controls, and undertook actions to curtail unprofitable projects in the US. Ultimately, beyond the glaring business model weaknesses/risks (and assessing potential positive inflection point) and overwhelming technological strengths/opportunities for FRONTEO as we go deeper beyond the usual top-down thematic approach to separate the true innovators and the swarming imitators, the most critical test is to distinguish between the devoted Missionaries forging a purpose and the promotional Mercenaries opportunistically worming themselves into riches-recognition – to focus on the H.E.R.O. innovators who are governed by a greater purpose in their pursuit to contribute to the welfare of people and guided by an inner compass in choosing and focusing on what they are willing to struggle for and what pains they are willing to endure, in continuing to do their quiet inner innovation work, persevering day in and day out. Our recent article on “GA technologies (TSE: 3491), ‘Japan’s Amazon in Real Estate’ Powered by Artificial Intelligence to Profitability” was also featured on a new magazine publication “Becoming Human: Artificial Intelligence“. The magazine explores the latest news and information on Artificial Intelligence, Machine Learning, Deep Learning, Big Data and what it means for Humanity, and article contributors include Kai-Fu Lee, CEO of Sinovation Ventures (创新工场) and former President of Google China. Thus far, of the 58 entrepreneurs and CEOs whom we had highlighted in our weekly research brief HeartWare, 25 are in our focused portfolio of 42 HERO Innovators while the rest are in our broader watchlist of 200+ stocks. Starting 2 January 2019, we are now located at 182 Cecil Street, Level 17 of the Frasers Tower building where Microsoft is one of the anchor tenants. Frasers Tower is located between the Bangkok Bank building and the Telok Ayer Chinese Methodist Church and is near the Amoy Street hawker food center. We welcome you to visit us over a warm cup of afternoon coffee at our new office on any day. Our emotional labor of love over the past months in sharing openly our research ideas (to battle-test our ideas by critiques and avoid blindspots in investing) and setting up the proper regulated UCITS fund structure to protect investors’ interests has deepened our conviction for the positive change that we will make together with H.E.R.O. – and we are getting closer to giving birth in February 2019 to H.E.R.O., the only Asia SMID-cap tech-focused fund in the industry and guarding investors’ interests in the regulated UCITS fund structure with daily NAV & daily liquidity and no exit fees. “The reason I set up FRONTEO in Aug 2003 is rooted in the mission to solve the problem of Asian companies fighting litigation measures globally, especially in the litigious US society where they are incurring huge costs. With the desire to protect companies in Asia including Japan, and as a result of thoroughly pursuing technology in a demanding environment where high precision is needed in a short period of time for international litigation support and for fraud investigation, we have created a unique proprietary artificial intelligence engine called KIBIT. KIBIT learns the tacit knowledge (experience, intuitive sense, know-how and subtleties of human thoughts that is difficult to verbalize) of human experts and can predict the future from the same feeling as human beings. We discovered that this artificial intelligence can be applied in new business areas in healthcare, business intelligence and digital communications to further solve social issues, in addition to the foundation of our business in legaltech. We want to protect enterprises that are not able to find the necessary information for their litigation battles and are at a disadvantage due to their poor data analysis technology. We want to identify and deliver the right necessary information to each patient among the flood of information. Such kind of passion enriches our AI (artificial intelligence) technologies and medical services every day. Through these activities, we are redefining “Bright Value,” which we want to make a reality, as ‘making our information society fairer by securely identifying the risks and opportunities buried in records’ using the data analysis knowhow and highly-advanced AI technologies we have developed,” commented Masahiro Morimoto, founder and CEO of FRONTEO (TSE: 2158). 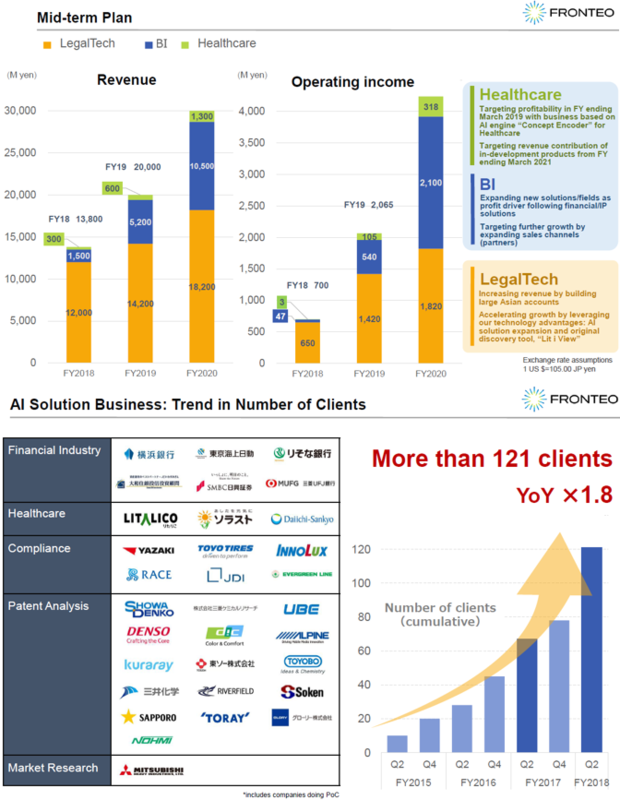 FRONTEO (TSE: 2158) who is Asia’s leading legaltech innovator powered by AI and expanding its AI solution “KIBIT” into healthcare and business intelligence as a SaaS (Software-as-a-Service) recurring revenue model for non-legal clients. Guided by the mission to illuminate the darkness lurking in data by securely identifying the risks and opportunities buried in records by utilizing technology, FRONTEO (formerly called UBIC) was founded in Aug 2003 by Masahiro Morimoto as a legaltech company supporting eDiscovery (electronic evidence disclosure) and digital forensic services for clients involved in US and international cross-border litigation, corporate investigations and intellectual property disputes. The data analytics platform Lit i View with “predictive coding” technology which supports multiple Asian languages (China, Japan, Korea) was developed in 2012 and was further enhanced with the AI engine KIBIT developed in Nov 2015 that is leveraged upon to develop the AI Solution business for non-legal clients. FRONTEO’s KIBIT series had acquired the number one market share of 26.8% based on sales value in the domestic natural language analysis market for 2016 and 2017 in the independent ITR survey announced on 11 Dec 2018, which is nearly doubled that of the 13.9% share held by the second place vendor. 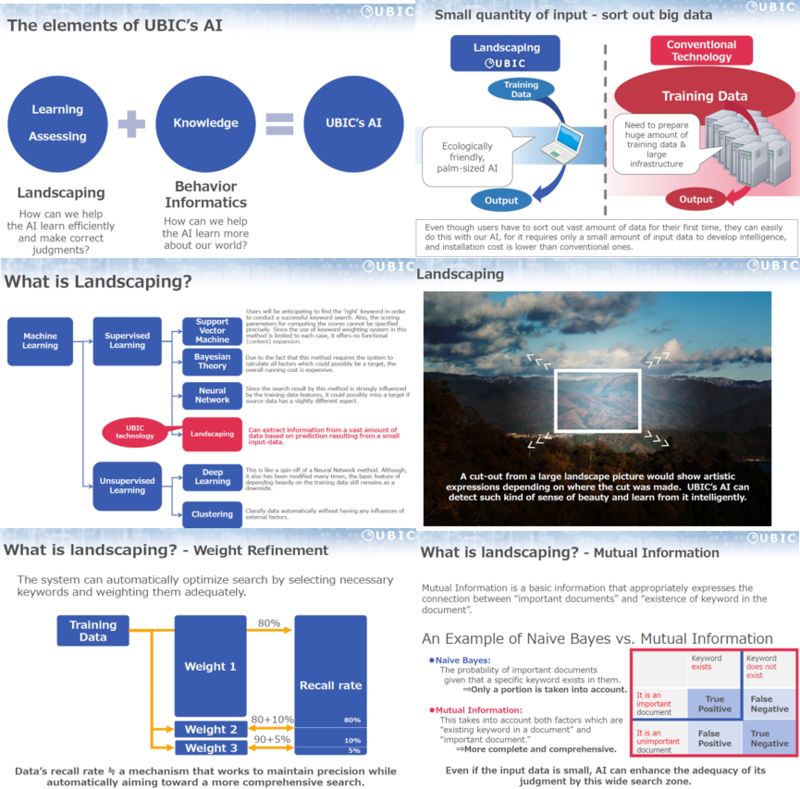 KIBIT uses the proprietary and unique “landscaping” AI technology to learn the “tacit knowledge” (experience and intuition) of human experts and, unlike all other AI technologies, KIBIT requires only small volume of data for effective machine learning to produce good quality output and solve customers’ problems. FRONTEO’s business model is a mix of project-based revenue (legaltech business) and recurring revenue (AI Solution business) with improving profitability in overall TTM (trailing twelve months) operating margin of 8.9%, ROE (= EBIT/ Equity) of 22% and ROA of 7.6%. The AI Solution business turned profitable in 3Q FY18/03 after hitting an inflection point in moving from PoC (proof-of-concept) for its clients to the full-launch stage and has amassed a wealth of solutions and cases to aid marketing; sales jumped 1.4-fold yoy and clients grown 1.8 times yoy to more than 121 customers as at 2Q FY2019 (Sept 2018). FRONTEO’s AI Solution business serves clients in the financial & healthcare industry/ “KIBIT Knowledge Probe” (MUFG Bank, Yokohama Bank, Resona Bank, Aeon Bank, SMBC Nikko Securities, Mitsubishi UFJ Morgan Stanley Securities; Daichi-Sankyo, LITALICO), compliance/ ”KIBIT Email Auditor” (Toyo Tires, Innolux, Evergreen Marine), and patent analysis/ ”KIBIT Patent Explorer” (Denso, Kikkoman, Sapporo, Kuraray, Showa Denko, Toray, Toyobo). FRONTEO launched its second AI engine Concept Encoder in Dec 2018 for the healthcare industry in drug discovery and clinical trials. Whereas KIBIT excels in natural language processing, Concept Encoder can analyze data other than language, including symbols and gene expression. The AI Solution business is expected to contribute 13% and 7.1% of sales and operating profit respectively in FY2019/03. In its new medium-term plan announced in May 2018, FRONTEO expects its AI Solution business to increase in sales from 1.8bn yen in FY2019/03 to 5.8bn in FY2020 and 11.8bn yen in FY2021, and contribute 31.2% of operating profit in FY2020 (645m yen) and 57.1% in FY2021 (2.418bn yen). However, despite its overwhelming technological superiority, FRONTEO has faced great difficulties over the years in trying to break through the established practices of US litigation cases that involve Asian companies, its main market, and grow its market share from the current 3%, as well as achieve a stable targeted operating profit margin of 10%. eDiscovery providers are often selected by the Asian companies’ US subsidiaries or by US attorneys, not by Asian companies themselves. In other words, when a lawsuit is filed in the US, Asian companies have a strong tendency to leave the selection of lawyers and other service providers to their local subsidiary. US lawyers tend to leave the choice of eDiscovery providers to their litigation support teams but the attorneys have a powerful sway in the vendor decision. Thus, unlike the other AI innovators we have investigated whose solutions were readily and rapidly adopted by their clients to solve high-value problems, FRONTEO was an odd case that stood out because the legal industry was particularly resistant to utilizing AI despite its effectiveness since the hours spent can be billed back to the clients and the attorneys make or influence the decisions on the IT vendor based on “relationships”. In short, when FRONTEO targeted its powerful AI legaltech solution to the end corporate clients in Asia involved in litigation suits and to the US litigation support team, it neglected its ultimate client – the US attorneys – and lost the war. On 14 Nov 2018, FRONTEO announced its 2Q18/Sep results (Apr – Sep 2018) in which 1H sales declined 4.1% to 5.61bn yen and operating profit jumped from losses to 196m yen. Revenue fell due to cutbacks on unprofitable projects and restructuring. Balance sheet is relatively healthy with debt of 2.86bn yen (gross cash 4.11bn yen, gross debt 6.98bn yen), or 9.3% of market value. In its new medium-term plan announced in May 2018, FRONTEO estimates FY2020/03 sales of 20bn yen (legaltech 14.2bn yen, AI 5.8bn yen) and operating profit of 2.065bn yen (legal tech 1.42bn yen, AI 645m yen); FY2021/03 sales of 30bn yen (legaltech 18.2bn yen, AI 11.8bn yen) and operating profit of 4.238bn yen (legal tech 1.82bn yen, AI 2.418bn yen).